Annexin V is a 36 kDa protein that has high affinity for phosphatidylserine (PS). During apoptosis, PS is translocated from the inner to the outer leaflet of the plasma membrane, where it can be stained by fluorescent conjugates of Annexin V. We offer Annexin V labeled with a wide selection of CF® dyes and other labels, including Near-IR CF® Dye Annexin V conjugates. We also offer Annexin V Kits with other apoptotic or necrotic cell stains. Annexin staining is calcium-dependent, and is traditionally performed in an optimized Annexin Binding Buffer. Annexin conjugates also can be used to stain cells in culture medium without a wash step for real-time apoptosis monitoring. Annexin can be fixed with formaldehyde after staining as long as calcium is included in all buffers. 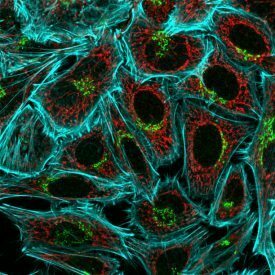 However, Annexin staining cannot be performed on fixed cells or tissues. For fixed cell apoptosis stains, see our TUNEL Assays. Apoptotic cells stained with CF®488A Annexin V (green) and NucView® 530 (red). α-Bungarotoxin (BTX) is a potent inhibitor for the motor endplate acetylcholine receptor. Fluorescent α-bungarotoxin conjugates can be used for labeling of nicotinic acetylcholine receptors at neuromuscular junctions in tissue sections. We offer α-bungarotoxin conjugated to a wide selection of CF® dyes and other labels, as well as unconjugated α-bungartoxin. Neuromuscular junction endplate in rat skeletal muscle cryosection stained with CF®594 α-bungarotoxin (red). Nuclei are stained with DAPI. Cholera toxin subunit B binds to ganglioside GM1 in lipid rafts on the plasma membrane. Cholera toxin subunit B is reported to be internalized by clathrin-dependent and independent pathways depending on cell type. We offer Cholera toxin subunit B conjugated to a selection of CF® dyes. The conjugates can be used to label lipid rafts on the cell surface, track endocytic vesicles, and as a retrograde neuronal tracer. Transferrin is a glycoprotein iron carrier that delivers iron to vertebrate cells via receptor-mediated endocytosis. After binding to its receptor on the cell surface, transferrin is rapidly internalized by invagination of clathrin-coated pits. Inside endocytic vesicles, the acidic environment favors dissociation of iron from the transferrin-receptor complex. Following the release of iron, the apotransferrin is recycled to the plasma membrane where it is released from its receptor to scavenge more iron. 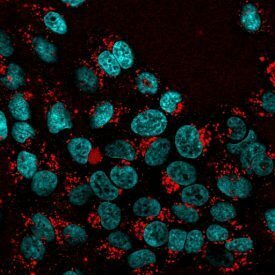 We offer human transferrin labeled with a selection of our bright and photostable CF® dyes for imaging of recycling endosomes by microscopy. HeLa cells were surface labeled with CF™488A cholera toxin B (green) at 4°C, then fixed, permeabilized, and stained with DAPI (blue). U87-MG cells were incubated with CF®680R transferrin (red), CF®488A dextran (green), and Hoechst 33342 (blue) for 30 minutes at 37°C, washed and imaged. Lectins are carbohydrate binding proteins that recognized specific sugar moieties on cell surface glycoproteins. 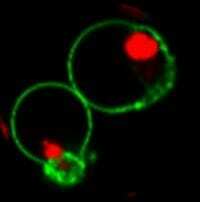 They can be used to selectively stain the cell surface of live cells, and withstand fixation and permeabilization. When cells are fixed and permeabilized before staining, fluorescent lectins stain both cell surface and organelles in the secretory pathway. Biotium offers CF® dye conjugates of WGA, Con A, and PNA in a variety of colors. WGA also is a live cell Gram stain for bacteria, while Concanavalin A and WGA conjugates can be used to stain cell wall and bud scars in yeast. See our Microbiology Technology Page for more information. Live HeLa cells stained with CF®594 ConA (red) and Hoechst 33342 (blue). 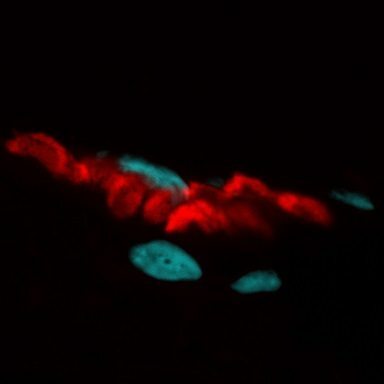 S. cerevisiae stained with CF®594 Con A (cell wall, red) and CF®488A WGA (bud scars, green). 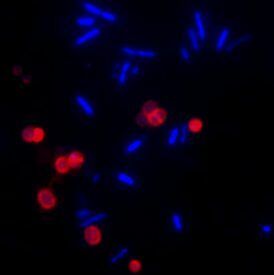 E. coli and Salmonella co-culture stained with DAPI (blue) and CF®633 WGA (red). Dextrans are water soluble branched-chain polysaccharides. Fluorescently labeled dextrans are used as markers for trafficking of fluid phase endocytic cargo to lysosomes. They are also used as tracers for epithelial and endothelial permeability. They can also be used as microinjected tracers for neuronal morphology. CF® Dye Dextrans are available with a variety of dye colors and molecular weights ranging from 10,000 to 250,000. Note: while formaldehyde fixation preserves the localization of dextrans in endosomes, the labeling generally cannot tolerate detergent permeabilization, likely because the dextran molecules remain in the fluid phase and do not associate closely enough with cellular proteins to become cross-linked by fixative. CF® Dye Bovine Serum Albumin (BSA) also can be used as a tracer for protein uptake and permeability. CF® Dye Hydrazides are water soluble dyes that can be used as microinjected cytoplasmic tracers or fluid-phase markers. Hydrazides also can be used for labeling aldehyde or ketone groups, such as carbohydrate molecules after peroxidation with periodate. However, for this application we recommend using CF® dye aminooxy forms, which are more reactive toward these groups than hydrazide forms. For 2D-DIGE platform, we recommend CFDI hydrazides. Also see our full selection of polar tracer dyes. Live HeLa cells incubated with CF®568 Dextran 10,000 MW (red), showing accumulation of the probe in endosomes. 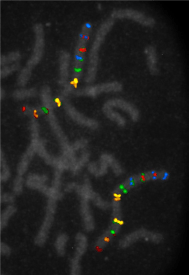 Labeled nucleotides can be used to synthesize labeled DNA probes for in situ hybridization and nucleic acid blotting applications. Labeled dUTP also can be used for TUNEL assay (also see our CF® Dye TUNEL Assay Kits). We also offer nucleotides linked to other fluorophores and biotin. Aminoallyl nucleotides can be used to introduce free amine groups into probes for subsequent labeling with reactive dyes or biotin. Bromine and digoxygenin (DIG) labeled nucleotides can be detected using specific antibodies. Bromo-deoxyuridine (BrdU) can be used to monitor DNA synthesis in cells (see our anti-BrdU antibodies). Fluorescently-labeled cAMP analogs have been imaged bound to the cAMP receptor on the surface of Dictyostelium cells. Interphase profiling of human chromosome 1 using a selection of Biotium’s dUTP conjugates. Image courtesy of Ramesh Babu, InteGen LLC. See the highlighted citation to learn more about this image. Phalloidin is a toxin isolated from the Amanita phalloides mushroom. It is a bicyclic peptide that binds specifically to F-actin. Fluorescently labeled phalloidins stain F-actin at nanomolar concentrations. Unlike antibodies, the binding of phalloidin is not species-specific, and non-specific staining is negligible. Biotium offers Phalloidin Conjugates with a wide selection of CF® dyes as well as traditional dyes and biotin. Phalloidin conjugates are not cell-permeable, and are typically used to stain fixed and permeabilized cells. However, they also can be loaded into live cells via cationic liposomes. 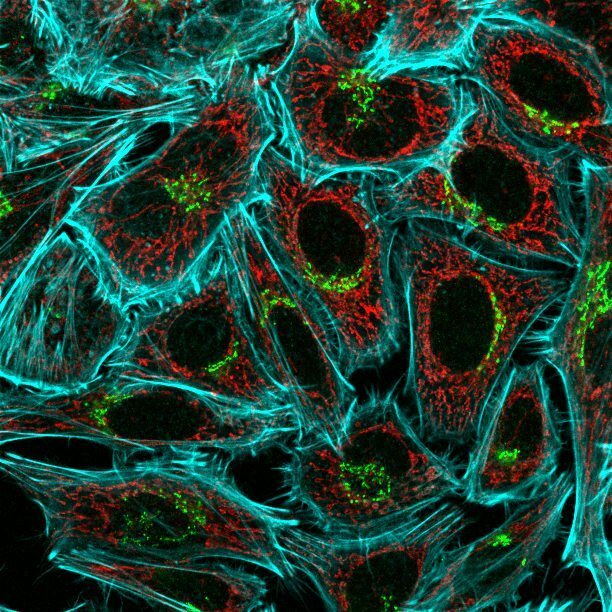 For live cell cytoskeletal staining, we also offer ViaFluor® Live Cell Microtubule Stains. HeLa cells stained with rabbit anti-COXIV and CF®555 goat anti-rabbit (mitochondria, red), mouse anti-Golgin 97 and CF®488A goat anti-mouse (Golgi apparatus, green), and far-red CF®640R phalloidin (actin filaments, pseudocolored cyan). Streptavidin is a bacterial protein with four biotin binding sites that binds biotin with extremely high affinity. Streptavidin conjugations are used in many applications to detect biotinylated antibodies or other targets, or to prepare multivalent complexes of biotinylated molecules. Our streptavidin conjugates are high quality streptavidin labeled with a wide selection CF® dyes and other labels. Also see our Monoclonal Anti-Biotin Conjugates. We provide a wide variety of biotin bioconjugates for detection with streptavidin conjugates or anti-biotin antibodies (see above). Also see primary and secondary antibodies available as biotin conjugates. We also offer the Biotin SE Protein Labeling Kit and Mix-n-Stain™ Biotin Antibody Labeling Kit, so you can label your own conjugates. We also offer fluorescent biotins and biocytin. Potential applications of fluorescent biotin include detection of biotin binding sites and the degree of biotinylation of proteins, and for the measurement of avidin and streptavidin in crude biological samples. Biocytin is biotin with a fixable amine group. Fluorescent biocytin can be used as a polar tracer by microinjection to study the morphology of cells. See our full selection of polar tracers.